Move from strife to LIFE! It seems that you need heart, not legs, to accomplish the unthinkable. Double amputee Ironman Scott Rigsby has a big-actually huge-heart. His story inspires and oftentimes takes away excuses; he embodies the unthinkable which he will now share with new amputee Amiee Copeland (both from Georgia). Rigsby, a double amputee, knows firsthand about the challenges Aimee Copeland will face when she is introduced to a life with prosthesis. Twenty six years ago it happened. A tractor trailer truck slammed into the vehicle Scott was in and one leg was severed and hlis other leg was mangled. 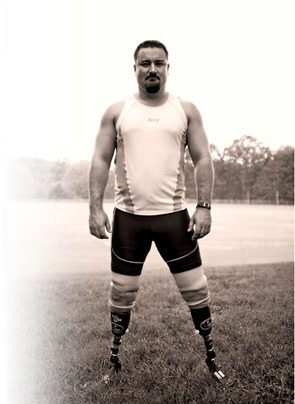 Ten years ago, he became a double amputee, the other leg was removed. Eventually an Atlanta Thrashers team physician fitted him with high-tech prosthetic legs, Rigsby, now an internationally known triathlete, said he was finally able to get on with his life. Through his foundation, Rigsby has also worked with hundreds of wounded veterans who have lost limbs in combat, and he’ll draw on that experience in working with Copeland. This man has a big heart, a message of courage, indomitable strength and endurance; he has become an “overcomer” and personifies the belief that anyone can and shall overcome. What an inspirational story, thank you! Thanks Marianne. I value our connection.